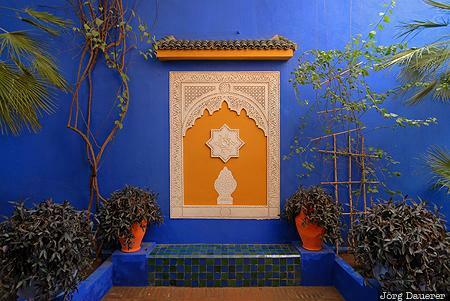 Flower pots and a blue wall in the colorful Jardin Majorelle, a botanical garden and artist's landscape garden in Marrakech. Marrakech is in Marrakech-Tensift-Al Haouz in central Morocco. This photo was taken in the afternoon of a sunny day in February of 2010. This photo was taken with a digital camera.